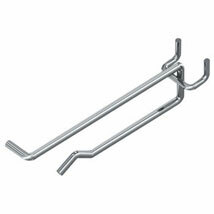 Low cost Gondola Peg Hooks available to ship today! Keep your displays neat and organized with Scanning Peg Hooks! Heavy Duty Scanning Hooks are made for pegboard and Gondola displays. Upper arm allows easy attachment of our Clear Label Holders (#2039 & #2040). Peg hook thickness is .228 in.